Click here to visit the Bruegger’s facebook and like them. 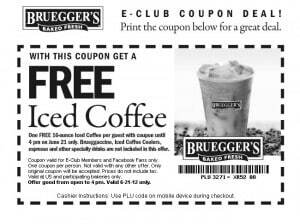 Then on the “Iced Coffee Coupon” tab, you’ll be able to print a coupon good for a free 16 oz iced coffee. It’s good until 4pm on 6/21.